Click for ongoing posts about Aaron, his memorial service, his death, and the malicious prosecution brought by the DoJ against him. To the extent possible under law, Cory Doctorow has waived all copyright and related or neighboring rights to "RIP, Aaron Swartz." Update: Go read Lessig: "He was brilliant, and funny. A kid genius. A soul, a conscience, the source of a question I have asked myself a million times: What would Aaron think? That person is gone today, driven to the edge by what a decent society would only call bullying. I get wrong. But I also get proportionality. And if you don’t get both, you don’t deserve to have the power of the United States government behind you." 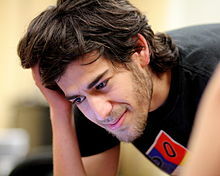 My friend Aaron Swartz committed suicide yesterday, Jan 11. He was 26. I got woken up with the news about an hour ago. I'm still digesting it -- I suspect I'll be digesting it for a long time -- but I thought it was important to put something public up so that we could talk about it. Aaron was a public guy. But he was also unmistakably a kid then, too. He would only eat white food. We'd go to a Chinese restaurant and he'd order steamed rice. I suggested that he might be a supertaster and told him how to check it out, and he did, and decided that he was. We had a good talk about the stomach problems he faced and about how he would need to be careful because supertasters have a tendency to avoid "bitter" vegetables and end up deficient in fibre and vitamins. He immediately researched the hell out of the subject, figured out a strategy for eating better, and sorted it. The next time I saw him (in Chicago, where he lived -- he took the El a long way from the suburbs to sit down and chat with me about distributed hash caching), he had a whole program in place. I introduced him to Larry Lessig, and he was active in the original Creative Commons technical team, and became very involved in technology-freedom issues. Aaron had powerful, deeply felt ideals, but he was also always an impressionable young man, someone who often found himself moved by new passions. He always seemed somehow in search of mentors, and none of those mentors ever seemed to match the impossible standards he held them (and himself) to. This was cause for real pain and distress for Aaron, and it was the root of his really unfortunate pattern of making high-profile, public denunciations of his friends and mentors. And it's a testament to Aaron's intellect, heart, and friendship that he was always forgiven for this. Many of us "grown ups" in Aaron's life have, over the years, sat down to talk about this, and about our protective feelings for him, and to check in with one another and make sure that no one was too stung by Aaron's disappointment in us. I think we all knew that, whatever the disappointment that Aaron expressed about us, it also reflected a disappointment in himself and the world. He also founded a group called DemandProgress, which used his technological savvy, money and passion to leverage victories in huge public policy fights. DemandProgress's work was one of the decisive factors in last year's victory over SOPA/PIPA, and that was only the start of his ambition. First he decides to take over the whole California Senate, so he can do things at scale. He finds a friend in each Senate district to run and plugs them into a web app he's made for managing their campaigns. It has a database of all the local reporters, so there's lots of local coverage for each of their campaign announcements. Then it's just a vote-finding machine. First it goes through your contacts list (via Facebook, twitter, IM, email, etc.) and lets you go down the list and try to recruit everyone to be a supporter. Every supporter is then asked to do the same thing with their contacts list. Once it's done people you know, it has you go after local activists who are likely to be supportive. Once all those people are recruited, it does donors (grabbing the local campaign donor records). And then it moves on to voters and people you could register to vote. All the while, it's doing massive A/B testing to optimize talking points for all these things. So as more calls are made and more supporters are recruited, it just keeps getting better and better at figuring out what will persuade people to volunteer. Plus the whole thing is built into a larger game/karma/points thing that makes it utterly addictive, with you always trying to stay one step ahead of your friends. Meanwhile GIS software that knows where every voter is is calculating the optimal places to hold events around the district. The press database is blasting them out -- and the press is coming, because they're actually fun. Instead of sober speeches about random words, they're much more like standup or the Daily Show -- full of great, witty soundbites that work perfectly in an evening newscast or a newspaper story. And because they're so entertaining and always a little different, they bring quite a following; they become events. And a big part of all of them getting the people there to pull out their smartphones and actually do some recruiting in the app, getting more people hooked on the game. He doesn't talk like a politician -- he knows you're sick of politicians spouting lies and politicians complaining about politicians spouting lies and the whole damn thing. He admits up front you don't trust a word he says -- and you shouldn't! But here's the difference: he's not in the pocket of the big corporations. And you know how you can tell? Because each week he brings out a new whistleblower to tell a story about how a big corporation has mistreated its workers or the environment or its customers -- just the kind of thing the current corruption in Sacramento is trying to cover up and that only he is going to fix. For his TV ads, his volunteer base all take a stab at making an ad for him and the program automatically A/B tests them by asking people in the district to review a new TV show. The ads are then inserted into the commercial breaks and at the end of the show, when you ask the user how they liked it, you also sneak in some political questions. Web ads are tested by getting people to click on ads for a free personality test and then giving them a personality test with your political ad along the side and asking them some political questions. (Ever see ads for a free personality test? That's what they really are. Everybody turns out to have the personality of a sparkle fish, which is nice and pleasant except when it meets someone it doesn't like, ...) Since it's random, whichever group scores closest to you on the political questions must be most affected by the ad. Then they're bought at what research shows to be the optimal time before the election, with careful selection of television show to maximize the appropriate voter demographics based on Nielsen data. This was so perfect that I basically ran it verbatim in the book. Aaron had an unbeatable combination of political insight, technical skill, and intelligence about people and issues. I think he could have revolutionized American (and worldwide) politics. His legacy may still yet do so. Instead, they threw the book at him. Even though MIT and JSTOR (the journal publisher) backed down, the prosecution kept on. I heard lots of theories: the feds who'd tried unsuccessfully to nail him for the PACER/RECAP stunt had a serious hate-on for him; the feds were chasing down all the Cambridge hackers who had any connection to Bradley Manning in the hopes of turning one of them, and other, less credible theories. A couple of lawyers close to the case told me that they thought Aaron would go to jail. This morning, a lot of people are speculating that Aaron killed himself because he was worried about doing time. That might be so. Imprisonment is one of my most visceral terrors, and it's at least credible that fear of losing his liberty, of being subjected to violence (and perhaps sexual violence) in prison, was what drove Aaron to take this step. But Aaron was also a person who'd had problems with depression for many years. He'd written about the subject publicly, and talked about it with his friends. I don't know if it's productive to speculate about that, but here's a thing that I do wonder about this morning, and that I hope you'll think about, too. I don't know for sure whether Aaron understood that any of us, any of his friends, would have taken a call from him at any hour of the day or night. I don't know if he understood that wherever he was, there were people who cared about him, who admired him, who would get on a plane or a bus or on a video-call and talk to him.